WILLEMSTAD - Recently a meeting took place between Minister of the Interior and Kingdom Relations of the Netherlands (BZK) Mrs. K. Ollongen, Minister of Traffic, Transport and Urban Planning Mrs. Z. Jesus Leito, Minister Education, Sport, Culture and Science Mrs. M. Alcalá-Wallé, representatives of Department of Public Works and organizations of monuments and heritage. The meeting took place in the context of the further development of Willemstad as a World Heritage Site. Since Willemstad is on the UNESCO World Heritage List, there was an exchange of views with the Dutch Minister. Canal belt in Amsterdam where the Minister works is also on the list. Minister Jesus-Leito explained how the city center can be developed and how many positive opportunities there are for cooperation between the Government and the private sector in the development of this. 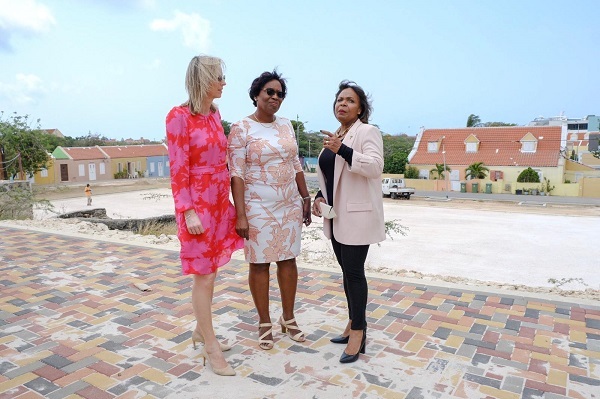 After a presentation by the Infrastructure and Spatial Development Sector Director Mrs. C. Manuel, the minister received a tour through Otrobanda, Scharloo, Fleur de Marie and part of Pietermaai. Under the leadership of the neighborhood representatives, Minister Ollongen was able to get an idea of ​​the development of each neighborhood.